We're back with another edition of our Game Bibs Fan Focus blog series! 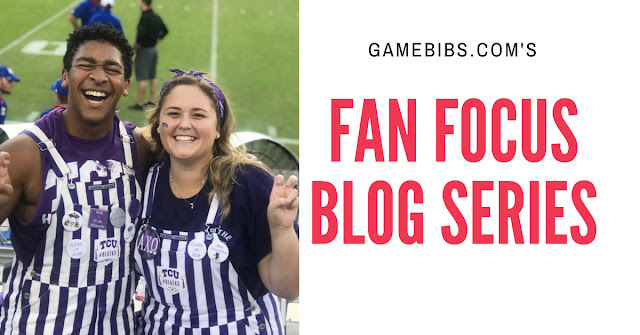 This time, our bibs-wearing superfan is Emily, a college student in Fort Worth, Texas. 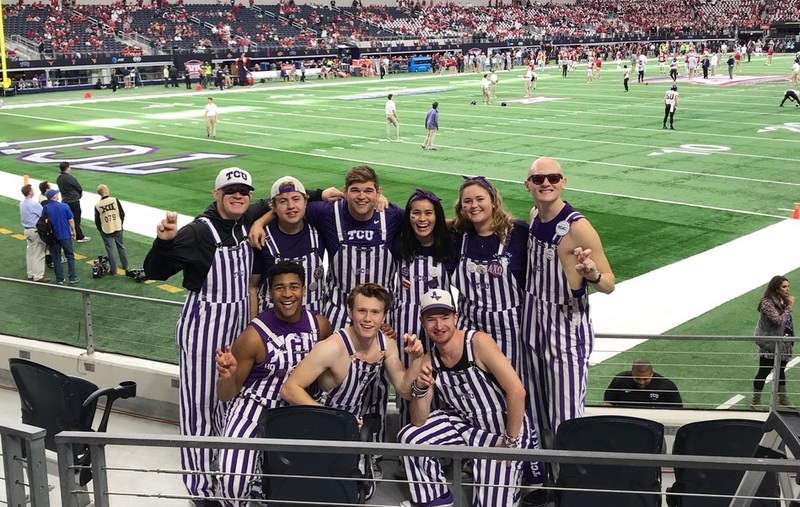 I’m part of a spirit organization, the TCU Dutchmen, and the Game Bibs are actually our uniform. We wear them to all sporting and promotional events that we get to attend and they’re kind of what we’re known for on campus. We’re the loud, crazy fans in the stripes in front of the student section trying to get you to cheer louder. So, I’ve been a part of the Dutchmen going on three years now and have been wearing the overalls proudly since my first game. As part of the spirit group, we arrive at the stadium three hours before kickoff. 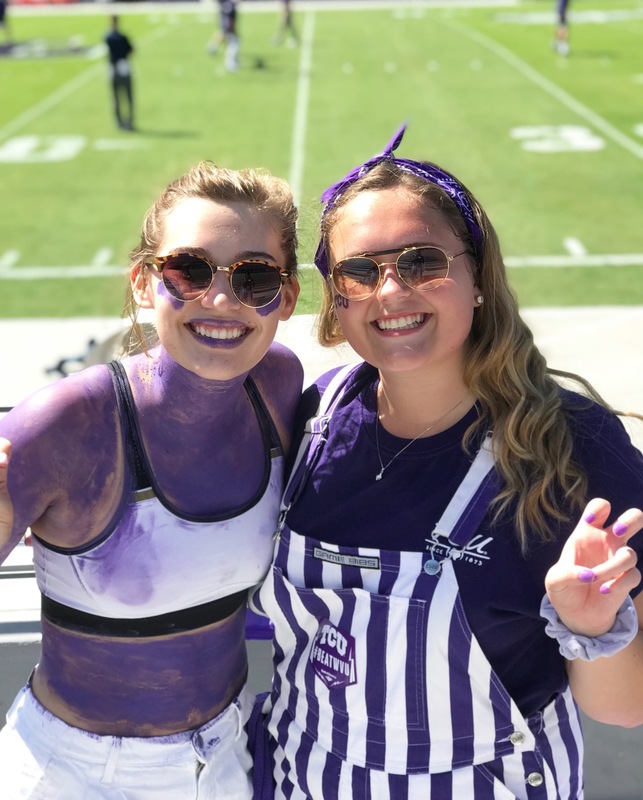 We get pumped up by setting up our ladders and rally towels to hand out, welcoming the team as they enter the stadium, and filling water misters to spray the fans on those hot games. All I Do Is Win by DJ Khaled. This is kind of a TCU tradition. When he says “Everybody hands go…” we replace “up” with “T-C-U” while fist pumping with the horned frog hand sign! I always carry my backpack with two water bottles, one Gatorade, a bag of Chex Mix, two granola bars, sunscreen, external phone charger, sunglasses, a hat, a small first aid kit, and extra face tattoos. I know that’s more than three items, but while working the games we’re held to a high expectation and encouraged not to leave our post during the game, so I have to be prepared for the long haul! What’s your favorite game day memory with your Game Bibs? I had the opportunity to watch this previous year’s (2017) Big 12 Championship game against OU from the front row. Our fan base is amazing and had a great turn out and actually had students wait in a 4-hour long line to get their tickets to this game. It might be an understatement to say this was a huge deal for the campus. I just wish the outcome would have been different, but I know the Frogs left it all on the field. I’m actually really obsessed with socks and am always on the lookout for unique pairs! Oh, or a fanny pack would be cool! Tell us about a favorite sports moment you’ve gotten to experience. On September 30, 2014 I got to attend the Wild Card game where my Kansas City Royals made it to the postseason! It was a huge high to watch them at the K the rest of the season. The next year when we won, I literally cried and screamed, waking up my college roommates down the hall. It was a way overdue win and being a fan for so long, it was priceless! Do you have any big plans for this year’s football season? This is my last year as a Dutchmen and an undergrad student, so I’m looking forward to making the most of it and hopefully expand our spirit organization! On the other hand, as a fan, I do hope to host some away game watch parties and I’ve even been looking into a mechanical bull for one of them! I’m a senior; go big or go home, right? Remember the Titans. It’s a classic that’s about more than just sports. It teaches you to be a good human being. Larry Bird. Growing up, I played competitive basketball for ten years. I was never the fastest or the most aggressive, but I could shoot like no other, so my dad would compare me to Larry Bird. He’d say Bird wasn’t the fastest on the court, but he made himself valuable by practicing different shots daily and learning how to get open, making him unstoppable. I strived to be like him and began practicing a couple hours a day before I gave up the sport in high school. Thanks so much for chatting with us, Emily, and we hope to see you on TV in the front row this upcoming season! Don't forget that you can be featured in our Fan Focus series, too! Just send us a message on Facebook or Instagram to get the ball rolling.